In December 2017, NAMI Mercer dedicated a donor recognition tree as a memorable and lasting way to acknowledge those who make a significant financial contribution to bolster our organization's long-term sustainability. 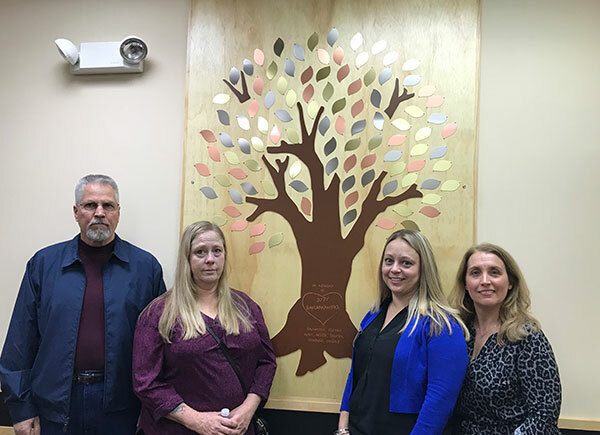 The wall tree, displayed in the front entrance of the NAMI Mercer Center, was donated by Walter and Jackie Baranowski in memory of their daughter, Judy. Donors who wish to honor someone with a gift to NAMI Mercer's Fund for the Future will receive an engraved leaf to be permanently displayed on the NAMI Mercer Giving Tree. A single, one-time gift of $500, $1,000, or $2,500 to memorialize or honor the person(s) chosen by the donor with a bronze, silver, or gold leaf, respectively. Legacy gifts given through estate plans or gifts of stock will also qualify as long as they meet the minimum $500 requirement. A personalized memorial or honorary tribute campaign of multiple smaller gifts from multiple donors, spanning up to one calendar year (Jan.-Dec.), with a total of at least $500, $1,000 or $2,500 earn the bronze, silver, or gold leaf, respectively. Contributions can be made online or by mail. Send a check, payable to NAMI Mercer with "Fund for the Future - Giving Tree Leaf" on the memo line.